Whatever type of floor you have, National Janitorial Service, Inc. has the right cleaning solution. 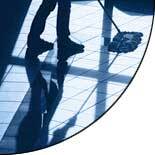 We know that a clean floor reflects a clean and efficient business. We want to make sure that clients visiting your office get a good image of your business. Our cleaners are experienced in floor maintenance and restoration and use advanced cleaning equipment to ensure customer satisfaction. Our staff is trained in all types of floor maintenance services including scrubbing, sealing, waxing and polishing. Like our other services, we tailor our cleaning programs to the specific needs of our clients.